Trying to snoop around like Michael Westen, but don’t have the tools? Maybe Swann’s PenCam can help you out! This over-sized pen can both record video and snap photos while still fitting into a shirt pocket. Although it may not capture high-quality content, you could still have a lot of fun trying to be an amateur spy with this product. So is the PenCam worth your time and money? Keep reading our review to find out. The body of the pen is very simple. The button on the top initiates recording and controls the power. 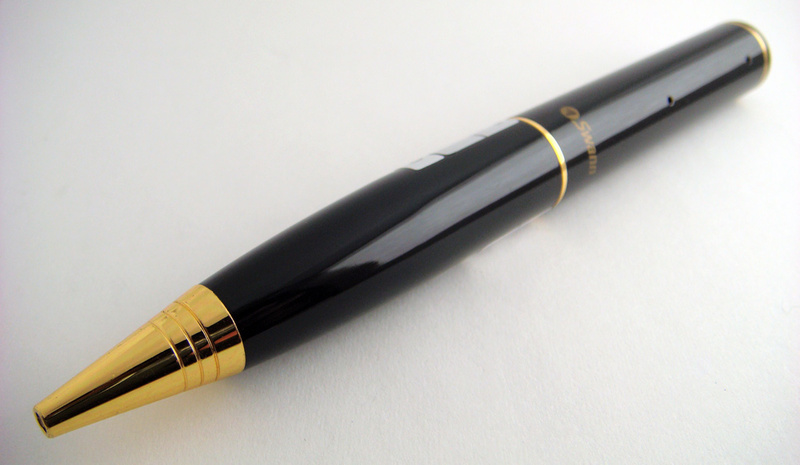 If the pen remains inactive for 30 seconds, it will turn off to preserve power. And in case the pen freezes up, you can push tiny reset button above the “Swann” logo. Next to this pinhole, a small LED light flashes blue for recording and the orange for standby. Moving on, the hidden camera, the essential component, is right above the shirt clip. The center of the pen unscrews to unveil a USB flash drive and a small switch that controls the recording mode. 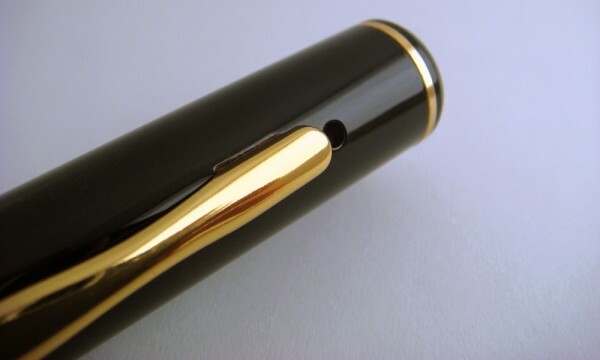 And finally, in case you need to jot down a few lines to avoid suspicion, simply turn the tip to use the PenCam as a pen. The gizmo runs for at least an hour and half on a full charge. All in all, I feel that the PenCam was designed for simplicity which should fit in well with most consumers. Unless you know what to look for, it’s actually quite difficult for others to see the camera and microphone. Regardless, I did find a few issues with the spy pen. With the width comparable to that of a dime, the pen feels a bit thick and hefty. In addition, there are obtrusive LED lights and a reset holes. People watching you might raise an eyebrow if they notice these. Also, you cannot discretely switch between picture and video mode without first unscrewing the pen. Although I wouldn’t expect Swann to compress it any further with the given technology and to avoid a price hike, they could have made it more conspicuous. For now, I won’t be switching from camera to camcorder mode in public and will be covering up the status light with a piece of black tape for recon work. To use video mode, slide the switch by the USB port to the left. Once the Pen is on, pushing the top button initiates recording. The LED light remains blue while recording and to stop, hit the button again. The video file gets saved as an .avi with a 640×480 resolution. On the 2GB model, you can continuously record for about 1.25 hours. With the 4GB, the time increases to about 2.5 hours. Although you’re not going to get HD quality, I thought that the videos looked better than the pictures. The directional microphone does a decent job recording sound, but it still fails to match the quality of a voice recorder. Also, there’s a date and time stamp for each video on the top left corner. Ultimately, taking the product’s price into consideration, I’ve decided that this feature is fairly decent. It was hard to constantly to keep the PenCam stable, but it sufficiently got the job done in the end. First off, make sure the mode switch is to the right. Once the blue LED comes up, push the top button to capture your image. However, you need to wait about 4-5 seconds to take another one. 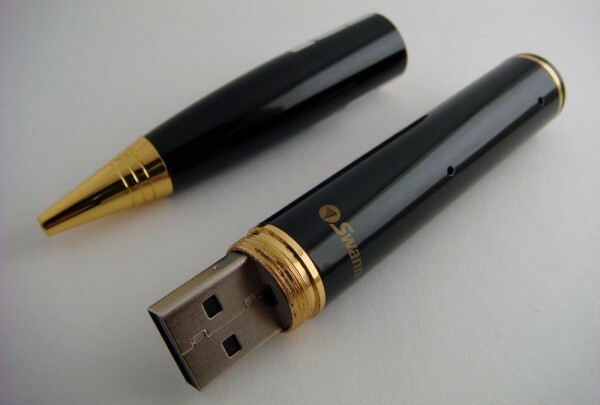 The pen can store over 10,000 photo files. Each picture you take with the Spy Pen has a resolution of 1280×1024 with an average size close to about 200KB. Again, the need to physically flip the switch between the modes was the only issue I faced. The quality of the pictures fares decent at best: They look like pictures taken by a first generation cell phone camera. However, the camera does capture bright lights very well. In order to obtain visible pictures, make sure to get an ample amount of light and limit any shaky camera movement. Unfortunately, this sensitivity makes it hard to covertly take pictures. Although this device was being marketed as the “Spy Pen”, I would advise real spies to use a different device. Anyways, check out some of the pictures below. I varied the lighting a bit and took them while moving and standing still. You can buy Swann’s 2GB PenCam on Amazon for $79.99. I found other pen cameras for a cheaper price, but I’m unsure of their quality. I feel that the price is a bit high, but if you need to subtly capture something, this pen packs a punch. The PenCam is simple, easy to use (plug & play), and does a satisfactory job. It’s also a fantastic ball-point pen!